Nielsen Audio Announces Monthly Reporting for Diary Markets Starting in July of 2019. This is a move that broadcasters in diary markets have been waiting for. Ratings giant Nielsen Audio announces it will “transform the measurement of markets that are measured with the audio diary from a quarterly or two times a year view to year-round measurement with monthly reporting. This more dynamic measurement solution enables clients to see seasonal shifts and react more quickly to marketplace changes. With this transition, radio will be able to find new insights and tell its reach story to advertisers each month.” The implementation of Continuous Diary Measurement will begin in phases with the first starting in July 2019 in the markets currently measured four times a year. The current four-book markets will convert to 12 currency releases that will comprise three months of data starting with the May/June/July 2019 report period. Effective with July 2019, approximately 70% of radio’s ad spend will be reported monthly by Nielsen Audio. Company managing director Brad Kelly says, “Big billion-dollar advertisers leave nothing to chance. Every decision they make is data driven and updated audience data is crucial for timely decisions. Nielsen Audio is excited to help diary market clients have a better understanding of the audio landscape and respond faster to dynamic market conditions. Continuous Diary Measurement will help radio reinforce its compelling reach story more often and provide fresh radio data to fuel marketing mix models — the decision tools big advertisers rely on to allocate budgets and evaluate the effect of their ad spend.” Nielsen plans to deliver monthly reports, covering six months of data in markets with at least 1,000 metro in-tab, and monthly reports covering 12 months of data in the smallest markets. Currently, Nielsen reports larger diary markets four times a year (winter, spring, summer and fall), mid-sized diary markets twice a year in the spring and fall and the smallest markets with two book averages of Spring/Fall and Fall/Spring. WTAM, Cleveland Adds ‘Geraldo in Cleveland’ Program and Begins 106.7 FM Simulcast. Heritage Cleveland news/talk WTAM unveils a number of programming additions that take effect today (9/24), starting with the AM station’s addition of translator W295DE at 106.7 FM to the station’s signal. Also, American news and talk icon Geraldo Rivera is launching at daily, one-hour program on WTAM called “Geraldo in Cleveland” that airs at 9:00 am. The iHeartMedia station says the program will address “a range of local and national headlines, including the latest business, political, and pop culture news.” Rivera says in a press release, “Cleveland is my home now and so is WTAM. History put me here by random chance and now I am a part of this great city where I fell in love with my wife of 15 years, Erica Rivera. I will continue to work on a national level with FOX News [as correspondent-at-large], and I look forward to sharing conversations and perspective locally with you every day. This is just the beginning of what I hope will be a long relationship with WTAM, iHeartMedia, and most importantly – YOU.” Also at WTAM, the station adds former Cleveland Indians pitcher and current Indians TV broadcaster Jensen Lewis to the afternoon daypart as co-host of the 6:00 pm sports show “Sports Feed 2.0” with Mike Trivisonno and Nick Camino. Finally, longtime station personalities Bill Wills – co-host of the morning drive show – and afternoon drive personality Mike Trivisonno have once again renewed their agreements with WTAM, both signing multi-year contract extensions. Wills will continue his 20-year tenure as anchor of morning drive and Trivisonno will extend his 22-year reign as afternoon drive on-air personality. Report: Gargano Off Mornings at WPEN-FM. According to a report by Rob Tornoe at Philly.com, Beasley Broadcast Group’s sports talk WPEN-FM “97.5 The Fanatic” is removing Anthony Gargano from his post as host of the morning show and set to replace him is NBC Sports Philadelphia (and former crosstown WIP) personality Marc Farzetta. The story says it’s unclear if current morning show cast members Bob Cooney and producer Jamie Lynch will remain with the new lineup. WPEN has not responded publicly to the report. Gargano left Entercom’s crosstown sports talker WIP in 2015 to take the WPEN gig. Gargano is still listed as morning host on the station’s website and spots with his voice are still airing. ‘Savage Nation’ Reinvented for the New Year; One-Hour Radio Show and One-Hour Podcast to Replace Current Show. Starting in January, Michael Savage and Westwood One transition his current three-hour, syndicated talk show into two separate entities – a one-hour version of “The Savage Nation” radio show and a new, original podcast (that will also be available for radio broadcast). Savage currently releases a podcast version of his radio show. This new podcast will be original content. Savage states, “As I move into the next phase of my 25-year radio career I hope to bring even more listeners to the medium of audio with ‘The Savage Nation.’ I will be free to innovate in unique ways on my podcast. The flexibility of the platform will permit me to expand my storytelling and insights into politics, books, food, cars, and rock and roll. I’m going to change the way talk radio is spoken and consumed.” WWO adds that the combination of podcast and broadcast will fuel the audience for both shows, saying Savage will cross-promote across “The Savage Nation” radio show and podcast, which will also be heavily promoted by Westwood One Podcast Network. RAB/NAB Radio Show Gets Underway This Week in Orlando. The 2018 Radio Show opens in Orlando tomorrow (9/25). Radio consultant Holland Cooke offers a little teaser about Edison Research’s “Share of the Ear” study that will be released at the Radio Show this year. He also has some insight on the new Echo Auto. Read his piece here. Among the numerous happenings at this year’s confab is a live broadcast of “The Bob & Tom Show” Wednesday through Friday. The broadcasts will take place in the North Foyer of the Hilton Orlando Bonnet Creek and will feature special guests; Frank Caliendo, Drew Hastings, Pat Godwin, and Greg Hahn. Kavanaugh Assault Allegations, Trump-Russia Investigation/Rosenstein Status, Midterm Elections, New Illegal Population Study, U.S.-China Trade War, Deadly Iran Parade Attack, NFL Action, and MLB Playoff Push Among Top News/Talk Stories Over the Weekend.This week’s scheduled testimony from Supreme Court nominee Brett Kavanaugh and his accuser, Christine Blasey Ford, and the new allegation from Kavanaugh’s Yale years; President Trump’s attacks on the Russia investigation and speculation about Deputy AG Rod Rosenstein’s job security; the coming midterm elections; a new illegal population study that declares real illegal population is 22 million – double previous estimates; the escalating placement of tariffs on goods by the U.S. and China; the attack on an Iranian military parade being blamed by Iran on the U.S. and Israel; the weekend’s NFL Action and the Major League Baseball playoff push were some of the most-talked-about stories on news/talk radio over the weekend, according to ongoing research from TALKERS magazine. Music Radio News and Career Moves. In Las Vegas, Beasley Media Group names Kris Fisher the new brand manager for rhythmic oldies KOAS “Old School 105.7” and hot AC KVGS “STAR 107.” Fisher was most recently PD at the company’s hip hop WCHZ. Beasley Las Vegas vice president and general manager Dennis Gwiazdon comments, “We’re thrilled that Kris will be joining our team in Las Vegas. After a lengthy nationwide search, it is especially gratifying to be able to promote someone from within our company. “HD98.3” and “Hot 95.5/ 93.1” have achieved some of their highest ratings under his direction. I’m looking forward to watching Kris work his magic for us here!”…..The nationally syndicated “DeDe in the Mornings” show is being added to the program schedule at iHeartMedia’s WHTY-FM, Columbus, Georgia “Hot 100.” Compass Media Networks officially launched “DeDe in the Mornings” in partnership with Service Broadcasting’s “K104” in Dallas on July 16. The program is also heard on WJMR-FM, Milwaukee; KATJ-HD2/K242CS, Victorville, California “HD 96.3”; and more…..Chicago on-air pro Brian Peck is named evening personality on Cumulus Media’s classic hits WLS-FM. Peck has recently shared evening hosting duties with fellow WLS personalities Tom O’Toole and Danny Lake. They will continue with their weekend shows along with Erin Carmen and Abby Ryan. Peck arrived in Chicago in 1992 as a morning co-host on WKQX “Q101.” He’s also worked at WTMX, WSHE, and WJMK. NYPost: How Mike Francesa Almost Didn’t Get WFAN Gig. As Mike Francesa’s historic run as afternoon drive personality on WFAN, New York winds down – he’s assured everyone he is leaving after December 15 – the New York Post publishes a piece by Don Burke that gives CBS Sports play-by-play man Jim Nantz credit for getting Francesa into WFAN when the station had no interest in hiring him. Believe it or not, the Emmis programming executives were turned off by Francesa’s Long Island accent and wanted national-level talent to star on the fledgling sports talk station. But Francesa and Jim Nantz had worked at CBS together and Nantz convinced Emmis exec Luke Griffin to give him a shot and he was eventually – and apparently reluctantly – hired for a weekend show. The rest, as they say, is history. Read the Post piece here. Cooney Named to Morning Co-Host Post at WPEN-FM, Philadelphia. Longtime Philadelphia sports media pro Bob Cooney is officially the new co-host of “The Fanatic Morning Show” on Beasley Media Group’s sports talk WPEN-FM, Philadelphia. He’s been filling in on “The Fanatic” for the past few months and now joins Anthony Gargano on the AM show. Cooney was a longtime 76ers beat writer with the Philadelphia Daily News but also covered the Flyers, the Eagles and more. The station says he’ll be part of its expanded Sixers coverage. Beasley Philly VP and market manager Joe Bell says, “We are absolutely thrilled to welcome Bob as the new co-host of the ‘Fanatic Morning Show.’ He is no stranger to Philly sports. His reputation is incredible. Bob and Anthony are the perfect team to serve as the official voice of the Philly sports fan!” At the same time, the station announces it has renewed its multi-year partnership with the NBA’s Philadelphia 76ers to serve as the flagship radio station. WPEN-FM will present the play-by-play, pre- and post-game shows, plus additional Sixers-related programming. Bears and WBBM ‘Newsradio 780 & 105.9FM’ Renew. Sports programming is an important format for CBS RADIO and the company – soon to join Entercom in a merger – proves that with the renewal of its deal for all-news WBBM-AM/WCFL-FM “WBBM Newsradio 780 & 105.9FM” to serve as the flagship radio station for Chicago Bears football. CBS RADIO Chicago SVP and market manager Tim Pohlman says, “All of us at CBS RADIO Chicago are thrilled to continue our 17-year partnership with the NFL’s most preeminent franchise. We thank the McCaskey family, Ted Phillips and everyone at the Chicago Bears for their commitment to keeping WBBM Newsradio 780 & 105.9FM as part of this first-class organization for years to come.” Out-of-game programming will include the “Bears Coaches Show” every Monday at 6:30 pm hosted by Jeff Joniak. “Bears All-Access” will air weekly throughout the year on sister sports station WSCR, featuring Tom Thayer and Zach Zaidman. All six CBS RADIO Chicago stations will also air a “Bears Noon Update” daily during the football season. Chip Franklin’s ‘Inside The Beltway’ Site Off to Positive Start. One month after the launch of the progressive site InsidetheBeltway.com, it’s garnered a million impressions, according to site founder – KGO, San Francisco talk host Chip Franklin. He tells TALKERS magazine that his videos that are available on the site have gotten more than 250,000 shares. Check out the site here. TALKERS News Notes. Atlantic City talk show host Harry Hurley tells TALKERS magazine that he’s booked Roger Stone – the Republican and Donald Trump campaign strategist who will testify before the House Intelligence Committee – on his program tomorrow morning (9/27). Stone will appear on Hurley’s WPGG program hours before he’ll appear on Capitol Hill to testify regarding the Trump-Russia investigation and Hurley says Stone promises to reveal what his testimony will entail…..The Alabama-based, nationally syndicated Rick & Bubba show got a call from President Trump yesterday morning (9/25) ahead of today’s special primary election for the open U.S. Senate seat there. The president also talked about the Graham-Cassidy Health Care Bill. See CNN’s report on the appearance here…..Salem Media Group promotes Steve Brodsky from general sales manager at Christian teaching KKLA-FM Los Angeles to market manager for the company’s San Diego operations that includes Christian KPRZ and news/talk KCBQ “1170 The Answer.”…..E.W. Scripps-owned news/talk WTMJ, Milwaukee is presenting the holiday radio show “WTMJ Saves Christmas” live at Turner Hall on Monday, November 27. It stars WTMJ hosts and other local voices and will be recorded in front of a live audience, with $5 from each ticket sold to benefit the Kids2Kids Christmas charity. “WTMJ Saves Christmas” will feature station personalities: Gene Mueller, Jane Matenaer, Jeff Wagner, Wayne Larrivee, John Mercure, Erik Bilstad, Melissa Barclay, and Steve Scaffidi. Trumps vs the NFL, Fate of the Graham-Cassidy Bill, Kim Jong-Un and Donald Trump Saber Rattling, Devastation of Puerto Rico, Alabama Senate Primary, Kushner Private Email Issue, Weiner Sentenced, MLB Playoff Push, and NFL Action Among Top News/Talk Stories Yesterday (9/25). The controversy over President Trump’s call to fire NFL players who protest during the national anthem and the league’s and players’ responses; whether or not the Graham-Cassidy health care bill will be put up for a vote in the Senate; the war of words between North Korea’s Kim Jong Un and President Donald Trump; the devastation in Puerto Rico caused by Hurricane Maria and its need for help from the U.S. government; the Alabama U.S. Senate primary race between Luther Strange and Roy Moore; allegations that Jared Kushner used a private email server for White House business; Michael Weiner is sentenced to 21 months in federal prison for sexting a minor; Major League Baseball’s playoff push; and Sunday’s NFL action were some of the most-talked-about stories on news/talk radio yesterday, according to ongoing research from TALKERS magazine. Agent Robert Eatman Dead at 65. Talent agent Robert Eatman passed away on Sunday (9/24) in Los Angeles after a battle with cancer. Eatman established his own agency in 1991 and represented some of the radio business’s top talent during the 1990s and 2000s, including Mancow Muller, Opie & Anthony, Shane “Rover” French, and more. Sitting Down with Dolly. 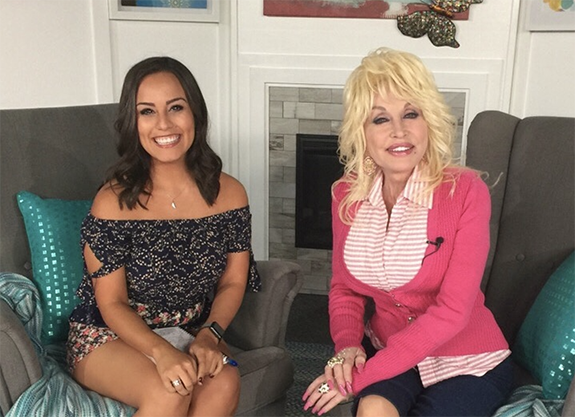 “NASH Nights Live” co-host Elaina Smith (left) visited the Nashville studio of country legend Dolly Parton (right) on Monday (9/25) to chat with Parton about her first-ever children’s album, I Believe in You. During the conversation, that also discussed such topics as women on country radio, Dollywood, sweatpants, both being tiny, working on Miley Cyrus’ new album and more. More Music Radio News and Career Moves — Country radio pro Matt McAllister is named the new morning personality at Entercom’s KKWF, Seattle “100.7 The Wolf,” replacing the Ellen Tailor-hosted AM program. McAllister comes to Seattle from his most recent position hosting mornings at iHeartMedia’s KNIX, Phoenix. He’s won Personality of the Year awards from both the Academy of Country Music and the Country Music Association. KKWF program director Drew Bland says, “Matt is creative, innovative, competitive, and laser-focused on bringing audiences compelling content for their morning commute. We are excited to welcome him to our team in Seattle, leading the next chapter of mornings for ‘100.7 The Wolf.’” The station says both a new show name and additional cast will be announced at a later date…..Las Vegas alternative rock KXTE “X107.5” announces that the “Holiday Havoc – Night Two” show scheduled for December 11 at the Palms Casino Resort will feature The Killers, with supporting acts Bleachers and Joywave. A portion of proceeds from the concert will benefit the Nevada SPCA…..Country KTTS, Springfield, Missouri is presenting the “4th Annual KTTS Springfield Country Music Awards Show” at Juanita K. Hammons Hall on October 25. It will feature a concert from Grammy, Country Music Association, and Academy of Country Music Award winner Maren Morris, plus special guest Russell Dickerson. The station says this is Springfield awards show with winners decided by local votes on a ballot at the station’s website. Local and national artist and song category winners will be announced during the awards ceremony portion of the evening. J.T. the Brick Hosting Local Show on ‘95.7 The GAME’ in San Francisco. Nationally syndicated sports talk star J.T. The Brick begins hosting a 10:00 am to 12:00 noon local show on Entercom’s KGMZ, San Francisco “95.7 The GAME” today. J.T. The Brick, a.k.a. John Tournour, is syndicated by FOX Sports Radio live from 8:00 pm to 11:00 pm ET with co-host Tomm Looney. Speaking about his station’s new show, KGMZ program director Don Kollins says, “I am excited to welcome J.T. back to the local market and to the ‘95.7 The GAME’ family. He’s an accomplished radio and television personality with high energy, strong Bay Area ties and stronger opinions. I think he brings appointment listening back to the 10:00 am-12:00 noon time slot.” J.T.’s ties to the Bay Area include six years as host of the Oakland Raiders pre- and post-game radio shows in San Francisco, host of “Behind the Shield” and the “Raiders Report” for Silver and Black Productions on Comcast SportsNet Bay Area as well as numerous guest appearances on FOX, CNBC and MSNBC network television programs. He will continue his syndicated radio show. Jon Marks to Exit ‘97.5 The Fanatic’ in Philly. According to Philly’s Crossing Broad, morning drive personality Jon Marks – who currently co-hosts sports talk WPEN-FM’s “Mornings with Anthony Gargano” – is exiting the station when his contract expires in October. There’s some speculation in Philadelphia about the future of WPEN-FM after Beasley assumes ownership from Greater Media. We know for sure based on Beasley’s recent presentation to lenders that it intends to realize $6.2 million in synergies from the combination of the two companies, but there are no specific plans announced for the sports talk outlet. Philly.com’s Rob Tornoe reports that Beasley interim CEO Caroline Beasley told the Philadelphia Inquirer’s John Takiff that the company has no plans to change the formats or talent of the Philly stations. While WPEN-FM scored a 1.5 share (persons 6+) in the August PPM survey against competitor WIP-FM’s 3.8 share, it’s unknown how revenue at WPEN-FM stacks up against expenses. Salem’s KRLA, Los Angeles Hosts Town Hall Forum in Pasadena on 2016 Election. An all-star panel of talk radio talent appeared at the Pasadena Civic Auditorium last night (9/18) as Salem Media Group’s KRLA, Los Angeles “AM 870 The Answer” presented the latest in its TOWNHALL 2016 series titled, “Hillary Clinton or Donald Trump – Who Will Best Lead Our Country over the Next Four Years?” In the photo above are (from l-r): moderator Hugh Hewitt, KRLA’s Brian Whitman, KRLA’s Elisha Krauss, SRN’s Larry Elder, SRN’s Mike Gallagher, Westwood One’s Mark Levin, SRN’s Michael Medved, SRN’s Dennis Prager, and KRLA’s Ben Shapiro. Harvey Nagler and Radio Journos Honored by RTDNF. Pictured here accepting the Barney Oldfield Award from the Radio Television Digital News Foundation is CBS RADIO News vice president Harvey Nagler (left). Nagler is pictured with the RTDNF chair Amy Tardif (right). The award is named for the founder of the Radio Television Digital News Foundation and presented to individuals who have made outstanding contributions to the success of the Foundation. Nagler is departing the board after serving two terms as a director at-large. He was a recipient of the Association’s John F. Hogan Award in 2014. Also honored this year was KSL-AM/FM, Salt Lake City news director Sheryl Worsley, who received the Bob Priddy Award, named for the Association’s longtime board member and two-time chairman. Worsley serves as RTDNA’s region 3 director and chairs the Association’s digital committee. The Presidential Race, Saturday’s Manhattan Bombing/Minnesota Stabbings, Putin Party Wins Russian Elections, Syrian Civil War/U.S.-Russia Tensions, Sunday’s Emmy Awards, NFL Action and MLB Playoffs Push Among Top News/Talk Stories Over the Weekend. The activities of presidential candidates Donald Trump and Hillary Clinton; the Saturday night bombing in NYC, the bombs found at a New Jersey train station, and the ISIS-inspired stabbings in Minnesota; Vladimir Putin’s United Russia party wins a majority in parliamentary elections; the unsteady Syrian cease-fire, the U.S.’ bombing of Syrian troops, and the tensions between the U.S. and Russia; Sunday evening’s politically charged Emmy Awards ceremony; Sunday’s NFL action and the playoff push in Major League Baseball were some of the most-talked-about stories on news/talk radio yesterday, according to ongoing research from TALKERS magazine. WTOP, Washington Names McMearty Program Director. Three months after former programmer Laurie Cantillo and Hubbard Radio parted ways, the company names 23-year staffer Mike McMearty program director for the multi-platform news operation. McMearty moves up from his news director post to the new position of director of news and programming. Hubbard Washington SVP/GM Joel Oxley comments, “Mike has been an integral part of our success for more than two decades. He has led the newsroom to hundreds of industry awards for excellence in journalism, including 18 National Murrow Awards and more than two dozen honors already in 2015. I look forward to him taking the department to new heights.” The station reports that Jim Battagliese continues his role as director of traffic, transit and weather. Mitchell Miller is promoted to senior news director managing the newsroom weekday mornings, Darci Marchese moves up to a full-time news director weekday afternoons, and Jamie Forzato now will manage news operations on the weekends as weekend managing editor. Meera Pal moves to social and digital engagement director reporting to Julia Ziegler, who moves from web and operations manager of FederalNewsRadio.com to become the news director of WTOP.com. All of the changes will take place over the next several weeks. Talkers New York 2015 Videos Begin Being Posted Today (6/22). Starting today with WFAN, New York superstar Mike Francesa’s opening “Keynote Greeting,” TALKERS will be posting videos of each of the sessions that made Talkers New York 2015’s agenda one of the most successful in the convention’s 18-year history. A session will be added each business day for the next nine days in a row, in the order that they took place at the event, until the entire agenda, video-recorded by Art Vuolo, is posted in a special Talkers TV feature sponsored by independent station owner, Michael Zwerling’s KSCO, Santa Cruz. The entire feature will remain posted for the rest of 2015. To see the opening session with Mike Francesa, please click here. Tomorrow: “The State of Radio Ratings” panel moderated by Premiere Networks/Fox News Channel icon Sean Hannity. Mike Francesa Opens Talkers New York 2015 on Upbeat Note – See Video Today! In a video posted today (6/22), legendary WFAN afternoon drive personality Mike Francesa sets the tone for what proved to be a realistic, but highly optimistic and solutions-oriented, agenda at the recent industry mega-conference, Talkers New York 2015 (6/12). The tell-it-like-it-is broadcaster – who has been ranked at #1 on the TALKERS “Heavy Hundred of Sports Talk Radio” for the past two consecutive years – blasted the pessimism that he says permeates the radio industry and offered his assessment of the tremendous opportunities available to radio in the digital era. Francesa drew applause form the packed house stating, “It’s amazing the amount of negativity that exists no matter what part of the business you’re in… I’m here to tell you that even though I am a little closer to the finish [of my career] than I am to the start, back [in 1987] when I was pounding on the door at WFAN with Jeff Smulyan – it took me 18 interviews to get hired, folks — I would be as bullish on radio and as gung ho about getting a career and feeding my family on radio NOW… as I was back then.” Francesa discusses the multi-platform nature of programming content today and the need/opportunity to monetize every element of it. He praises the spread of smartphones as being equivalent to a theoretical resurgence of the old transistor radio and thus providing radio with universal portability… something it hasn’t enjoyed in decades. He discusses the importance of branding in today’s media environment and vehemently champions the importance of “live and local” being the key to radio’s survival and purpose in the coming era. To see Francesa’s entire speech, please click here. Rob Ellis Lands at WPEN, Philadelphia. Former WIP-FM, Philadelphia personality Rob Ellis debuts on crosstown Greater Media’s WPEN, Philadelphia, partnered up with Harry Mayes. Ellis exited CBS RADIO’s WIP in March after failing to come to terms on a contract renewal with the station. Ellis, who also hosts “Breakfast on Broad” on cable’s Comcast SportsNet Philadelphia, takes over as co-host of the midday show for Eytan Shander, who remains with the company. Former WIP personality Anthony Gargano also joined WPEN late last year as morning drive personality. Odds & Sods. Both FOX Sports and ESPN are reporting that former San Diego Chargers player and longtime radio play-by-play analyst Hank Bauer has been let go from the radio broadcast team. Bauer served a one-game suspension last season – missing the final preseason game – after he used a Jewish slur during the third preseason game. He later apologized…..Westwood One presents coverage of the NCAA Division I Men’s College World Series Finals beginning this evening from TD Ameritrade Park Omaha in Nebraska. The best-of-three championship series between Vanderbilt and Virginia is being covered by (pictured here in front of the famous Road to Omaha statue standing from left to right) Ted Emrich, Scott Graham, and Kevin Kugler. FOX News Commentators Ellen Ratner and Jim Pinkerton Honored by Grenada’s St. George’s University. Media personalities Ellen Ratner and Jim Pinkerton were recognized with honorary doctorates from St. George’s University in Grenada for their charitable works. Pinkerton and Ratner – who work together as conservative and liberal commentators, respectively, on FOX News Channel’s “FOX & Friends Weekend” on the “Long and Short of It” segment – are known for separate charitable efforts. Pinkerton has been working with the school assisting with its cure strategy for diseases. Ratner has been working for years to provide some of the basic tools for subsistence farming to people in South Sudan. Ratner (third from left) and Pinkerton (fourth from left) are seen here receiving their honorary degrees. New Kevin McCullough-Hosted Show Debuts on WNYM, New York Tonight. Syndicated talk host and XtreMEDIA principal Kevin McCullough adds another talk program to his busy schedule as he debuts “Late Night with Kevin McCullough” airing on Salem Media Group’s WNYM, New York “AM 970 The Answer” from 10:00 pm to 12:00 midnight. McCullough says the show will be him “rounding out the talk radio day with an irreverent look at the news, the talk radio industry, and everything else in life,” and says it’s a joint endeavor between his company and Salem New York. McCullough says the show will “in some ways be a throwback to the greatest era of radio where the steaks always sizzled and the beverages are always cold! Newsmakers, icons, and listeners will drive the conversation. ‘The Ladies Lounge’ will feature some of the most important but not-yet-amplified voices of ladies in talk media – plus a ‘house band’ called The Hot Sardines.” The program debuts tonight (4/20). Salem Rolls Out Metaxas Show. The radio syndication of popular author and TV personality Eric Metaxas by Salem Radio Network was announced back in late February but today the show celebrates its national debut. Although Metaxas is well known in the Christian community, Salem says it believes his program will crossover into the news/talk format as well. The show will launch in 26 of the top 30 markets, mostly on Salem O&Os. Salem SVP Phil Boyce says, “This is the biggest rollout for Salem Radio Network in 10 years. Eric’s show will be different, and a little bit about everything. His personality and sense of humor will shine through.” The show airs live from 2:00 pm to 4:00 pm ET. Industry Programmers to Take Part in ‘Programming Talk Radio in 2015’ at Talkers New York Conference. On Friday, June 12 at the India House in Manhattan’s Financial District, the talk media industry will gather for the 20th annual edition of the TALKERS magazine-presented conference. One of the nine panel discussions and presentations will be titled, “Programming Talk Radio in 2015” and will feature panelists: Carl Anderson, EVP, Programming, iHeartMedia; Mike Bendixen, Program Director, Newstalk 1010, Toronto; Valerie Geller, CEO Geller Media International; Scott Masteller, Program Director, WBAL, Baltimore; Mike McVay, SVP, Content & Programming, Cumulus Media; and Paul Vandenburgh, owner and GM, WGDJ, Albany. It will be moderated by TALKERS magazine VP and executive editor Kevin Casey. Issues addressed will include: integrating digital into news/talk programming; dealing with resistance to advertising; the challenge of keeping the format fresh; finding the next generation of talent; allocating resources to the actual program and to social media; seeking alternative ways to monetize the format; balancing the levels of local and syndicated talk content; and more. Casey says, “I’m really looking forward to talking about the state – and the future – of the format with this outstanding panel of industry heavyweights. These questions are on the minds of industry programmers and it will be enlightening to hear what our panelists have to say.” Registrations for Talkers New York 2015 are moving fast. To reserve your place, call 413-565-5413. For more information about the event, click here. Odds & Sods. At the Salem Media Group’s New York news/talk outlet WNYM “AM 970 the Answer,” the new Eric Metaxas show being syndicated nationally by the company’s Salem Radio Network (see story above) bumps Chicago-based Joe Walsh from the 5:00 pm to 7:00 pm slot on the station. Walsh had been heard there since January of 2014. Walsh remains on WIND, Chicago…..In Boston, market news pro Henry Santoro leaves his gig with streaming station RadioBDC (operated by the Boston Globe and Boston.com) to join pubcaster WGBH as midday anchor. Prior to joining RadioBDC, Santoro had spent almost 30 years with the old alternative outlet WFNX. Ninth Annual ‘Hold Their Feet to the Fire’ Event Kicks Off Today. The annual Washington, DC radio row produced by the Federation for American Immigration Reform is taking place today and tomorrow at the Phoenix Park Hotel on Capitol Hill. As in the eight years prior, the event consists of some 45 radio talk hosts from across the country broadcasting live, debating immigration policy while interviewing members of Congress, law enforcement officials, experts, activists and citizens who live along the border. FAIR says that “this year’s event is focusing on the aftermath of President Obama’s amnesty and his continued abuse of executive power, the GOP’s internal battle over how to tackle immigration and the ongoing border crisis with its implications for national security risks.” Event general manager and FAIR spokesman Bob Dane comments, “Politicians fear and respect the amplitude of talk radio. Hold Their Feet to the Fire speaks for millions of radio listeners and, this year, is proving that the mic is mightier than Obama’s pen.” Pictured here are WIBC-FM, Indianapolis late morning host Greg Garrison (left) and TALKERS magazine publisher Michael Harrison (right). Harrison appeared on Garrison’s program to discuss talk radio’s role in the immigration issue and the relative First Amendment component. NAB Announces 2015 Crystal Radio Award Winners. At yesterday’s NAB Show Radio Luncheon, the winners of the 2015 Crystal Radio Awards were announced. This was the 28th presentation of the Crystal Radio Awards designed to recognize radio stations for their outstanding, year-round commitment to community service. The winners were chosen from the 50 finalists. They are: news/talk KRMG-FM Tulsa; news/talk WSB-AM Atlanta; country KTTS, Springfield, Missouri; news/talk WSOY, Decatur, Illinois; hot AC WAFL, Milford, Delaware; hot AC WTMX, Chicago; classic rock WDRV, Chicago; news WTOP-FM, Washington; news WINS, New York; and hip hop WUSL, Philadelphia. NAB Crystal Radio Award finalists were chosen by a panel of judges representing broadcasting, community service organizations and public relations firms. Also at the luncheon, Kevin Ryder and Gene “Bean” Baxter (pictured here) of CBS RADIO’s modern rock KROQ, Los Angeles were inducted into the NAB Broadcasting Hall of Fame. Cooke: Report from NAB Show and NMX in Las Vegas. Radio consultant Holland Cooke is in Las Vegas this week covering the NAB Show and the co-located NMX and files this report. Cooke says two presentations stuck out for him on Tuesday including the NMX’s “Make Your Marketing Memorable with Visual Storytelling” by Ekaterina Walter. For radio practitioners, the internet is the place to use images and Cooke reports some data he heard is eye-opening as Walter said, “Thinking in pictures is our nature. Images act like shortcuts to the brain” and “speak to the heart and tell stories.” She noted that “scientists say the average modern adult attention span is between 2.8 and 8 seconds,” and that “90% of all information transmitted to the brain is visual.” Cooke says the NAB’s “Small and Medium Radio Markets Idea Exchange” alone is “worth the trip.” Read more from Holland Cooke here. Report: New AM Show Slated for WPEN-FM, Philadelphia. Calling it the “worst-kept secret” in Philadelphia sports radio, a report at Philly.com is saying former WIP-FM personality Anthony Gargano will be paired up with current WPEN-FM midday host Jon Marks for the morning drive show on Greater Media’s “97.5 The Fanatic” before the month is out. Gargano left the CBS RADIO sports talker recently after receiving what he called a “low-ball offer” to remain with the station. Jon Marks had been co-hosting the midday show at WPEN-FM with Sean Brace but Brace exited the station earlier this month. Currently, the station airs ESPN Radio’s Mike & Mike show. If Gargano and Marks do end up in mornings together, it leaves a vacancy in the 12:00 noon to 2:00 pm show. Nielsen Audio Releases Second Round of Mach 2015 PPM Data. The second of four rounds of March 2015 PPM ratings data from Nielsen Audio has been released for 12 markets including: Washington, Boston, Detroit, Miami, Seattle, Phoenix, Minneapolis, San Diego, Tampa, Denver, Baltimore, and St. Louis. The March 2015 survey period covered February 26 through March 25. You can find the complete ratings from subscribing stations here. Additionally, TALKERS/RadioInfo managing editor Mike Kinosian provides his “Ten Takeaways” from this group on the main page of our sister publication here. Odds & Sods. Former MLB pitcher Curt Schilling joins Entercom’s WEEI-FM, Boston as a baseball analyst. The Red Sox star will be part of the Dennis & Callahan show every Wednesday at 8:05 am during baseball season. Schilling is also part of the broadcast team for ESPN’s “Sunday Night Baseball.”…..KOA, Denver weekend personality Ross Kaminsky is spending some time this week filling in for Rod Arquette on iHeartMedia’s KNRS, Salt Lake City (Tuesday and Friday). Recently, Kaminsky has also filled in for Mandy Connell on KHOW, Denver; Leland Conway on WHAS, Louisville; and for the TRN-syndicated Jerry Doyle. Marco Rubio Declaration/2016 Presidential Prospects, ISIS Military Action in Iraq, Iran Nuclear Program Negotiations, Obama’s Cuba Policy, Tax Day, and MLB Action Among Top News/Talk Stories Yesterday (4/14). The declaration of his candidacy for president by Florida Senator Marco Rubio and the rest of the field of Republican prospects and Democrat Hillary Clinton; the military action by ISIS in Iraq; the ongoing controversy over Iran’s nuclear program and the negotiations with the West; President Obama’s policy regarding Cuba; chatter about Tax Day; and the young MLB season action were some of the most-talked-about stories on news/talk radio yesterday, according to ongoing research from TALKERS. Brady: The Power of Legacy Media. Sales and management pro Bill Brady writes in a piece published in TALKERS magazine today (4/6), that we’ve been hit with a barrage of non-stop brainwashing about the “power” of digital media for so long now that hardly anyone questions the validity of the narrative. But he does. And Brady says there are problems with what we’ve been told all these years. “This is the product of the PR machine employed by digital start-ups to build and reinforce their investment value through rounds of funding leading to an eventual IPO. Media consultants who hope to survive as digital experts also contribute mightily to the noise. So do media companies themselves who are complicit in allowing the misguided narrative to go on and on and on.” For those impressed with the digital revenue being reported by traditional media companies, be on guard. Brady says, “Some of the digital revenue reported by traditional media companies is the result of bundling discounts which, in effect, result in broadcast revenue being reported as digital revenue. If it wasn’t for this phenomenon, some companies might actually be reporting year-to-year increases in core broadcast revenues. Their digital revenues, small in comparison to core revenue, would thus be less impressive. But, we would at least be seeing accurate digital revenue figures that are not artificially inflated and the reputation of legacy media would be less tarnished.” Read more of Brady’s cautionary column here. Radio America’s Dana Loesch Helps Raise $840,000 for Threatened Indiana Pizzeria. The owners of a small-town pizza joint in Indiana may be the recipients of more than $840,000 raised via GoFundMe after Radio America-syndicated radio talk show host Dana Loesch came to their aid. The owners of Memories Pizza were asked by a reporter about their stance on Indiana’s Religious Freedom Restoration Act. After answering honestly that they supported the law, they became victims of death threats. Loesch heard about the case and started the GoFundMe campaign to help offset the costs of having to shut down the business due to the threats plus the possibility the family may not be able to re-open after the dust settles. Changes at Greater Media’s Sports Talker WPEN-FM, Philadelphia. A couple of on-air staffing changes took place recently at Greater Media’s Philadelphia sports talk outlet WPEN-FM “97.5 The Fanatic.” Sean Brace exits the 12:00 noon to 2:00 pm program he co-hosted with Jon Marks. Brace says in a Tweet that he’d been with the station for seven years and thanks Greater Media for the opportunity. Also, Philly.com is reporting that producer Steve Vassalotti also exited the station last week, though that has not been confirmed. On Friday, evening host Nick Kayal told listeners the show would be his last with WPEN-FM as he’s exiting to join SiriusXM. This round of attrition is fueling speculation that Philly sports talk pro Anthony Gargano will join the station. Gargano – a longtime WIP, Philadelphia personality who recently left that station after receiving what he termed a low-ball offer to remain – appeared on WPEN-FM’s Mike Missanelli show on April Fool’s Day. Bringing the Final Four to Radio Listeners. Pictured here at Lucas Oil Stadium in Indianapolis is Westwood One radio personality Jim Gray (left) interviewing Wisconsin Badgers coach Bo Ryan (right) for the network’s coverage of the NCAA Men’s Final Four. This interview took place prior to Wisconsin’s upset of previously undefeated Kentucky on Saturday evening. Odds & Sods. For a story on faith-based entertainment, NBC News visited the studios of Salem Media Group’s WMCA, New York “AM 570 The Mission” to shoot some video of the station’s Dr. AR Bernard hosting his show. Salem SVP/spoken word format for Salem Media Group and Salem Radio Network Phil Boyce tells TALKERS magazine, “The shoot was for a story to air on ‘NBC Nightly News’ on Sunday evening about faith-based entertainment in movies, on TV, and on the radio. They are tying it in to NBC’s broadcast of ‘AD, The Bible Continues,’ which started Sunday night.”…..Sports giant ESPN announces new Spanish-language programming to air on WEPN-AM, New York “ESPN Deportes Radio” this season. DJ George Nenadich talks music and sports on a new show called “Fusion 1050”; Felix DeJesus, the Spanish-language voice of the Yankees hosts “El Mundo de las Grandes Ligas”; and all the news and analysis from local teams will be heard on the new show “Resumen Final.”…..For an update on the status of NextRadio, interested parties can hear from Emmis chairman & CEO Jeff Smulyan as he presents news about the free smartphone app that combines local FM radio broadcast with the internet to create a visually engaging, interactive artist and advertising experience. To register for the webinar that takes place on Tuesday, April 7, from 1:00 pm to 1:30 pm EST, visit the following site: https://attendee.gotowebinar.com/register/2755831702406830082. Top News/Talk Stories of 2014. As is the tradition at TALKERS magazine, the end of the calendar year provides the opportunity to look back and present the industry with a list of talk radio’s most-talked-about stories and people of 2014. Regular TALKERS readers are aware that we present the Talkers TenTM each week – a chart that shows the top stories and people of the week as discussed on news/talk radio based upon ongoing research from TALKERS. This year-end chart uses that data. The accompanying graphic presents the charts for 2014. Big John Howell to Exit WIND, Chicago. According to a report from Chicago media writer Robert Feder, Big John Howell is exiting his morning drive gig with Salem Communicatons’ news/talk WIND, Chicago “560 The Answer.” Feder writes that Howell was offered a contract renewal but he turned it down. Feder says Howell’s contract runs out at the end of this month but Howell may work into January while the company decides how to replace him. But the rumor is that Howell may jump across the street to join Cumulus Media’s WLS-AM. Howell has hosted the morning show for the past eight years and currently works with Amy Jacobson as co-host. Round Two of December PPM Data Released. The second of four rounds of December 2014 PPM data from Nielsen Audio has been released for 12 markets including: Washington, Boston, Detroit, Miami, Seattle, Phoenix, Minneapolis, San Diego, Tampa, Denver, Baltimore, and St. Louis. The survey period was November 6 through December 3. TALKERS magazine’s sister publication RadioInfo has all of the numbers from subscribing stations here. In addition, managing editor Mike Kinosian presents his “Ten Takeaways” from this batch of ratings on the main page at RadioInfo.com here. Odds & Sods. According to Jose Lambiet’s Gossip Extra, the Rick Sessa-hosted “American Biker Talk Radio” show is moving from its current station – WSVU, West Palm Beach – to rock-formatted WBGF, Belle Glade, Florida “93.5 The Bar” beginning in January. Inconceivable Guest Appearance! Nationally syndicated Salem Radio Network talk star Michael Medved (right) poses for a photo outside the studio after interviewing actor Carey Elwes (left) – star of the classic film, The Princess Bride. Elwes stopped by the show’s Seattle studios to chat with Medved – a noted film critic as well as talk personality – about his new book, As You Wish: Inconceivable Tales from the Making of The Princess Bride (Touchstone 2014). Staff Recognizes End of MarketWatch Radio Network. The air staff of the MarketWatch Radio Network held a farewell party last week to celebrate one last time together. Dow Jones’ exit from the AM/FM radio business at the end of the year spells the end for the business news network founded by Frank Barnako in 1999. Barnako made a special appearance at the party joining staffers (from left to right, also noting stations they served) back row: Tracy Johnke (WBZ-AM, Boston), Andrew O’Day (WINS, New York and WBZ-AM), Alisa Parenti (WBZ-AM and WBBM-AM, Chicago), Joan Doniger (WBBM-AM), Steve Potisk (KNX, Los Angeles and KYW, Philadelphia), Adrienne Mitchell (WBBM-AM, KRLD-AM, Dallas and KCBS-AM, San Francisco), Ann Cates (WCCO, Minneapolis, WBBM-AM, KCBS-AM). Front row: Barnako and WSJ Radio executive editor John Wordock. BFoA Creates Bill Burton Memorial Fund. The recent passing of beloved radio pro Bill Burton is recognized by The Broadcasters Foundation of America as it establishes the Bill Burton Memorial Fund. Burton, known for his trademark words of encouragement, “Be Fabulous,” died last weekend from head injuries suffered after a fall at his home. He was 85. Former BFoA executive and long-time friend and colleague Carl Butrum states, “Bill’s influence inspired countless individuals in the radio business. Radio owes Bill our gratitude for his wisdom and for imparting to us his boundless positive attitude, which infected everyone who came into contact with him. We mourn his loss, but remember the great man with The Bill Burton Memorial Fund.” Donations to the Bill Burton Memorial Fund are being accepted at the Broadcasters Foundation website at www.broadcastersfoundation.org, or by calling 212-373-8250, or emailing info@thebfoa.org. Sony to Release ‘The Interview,’ New York Police Killings Protests/Obama Racism Remarks, Potential 2016 Presidential Candidates, Joe Cocker Dies, Christmas Holiday, ISIS Violence, and NFL Playoffs Push/Possible Coaching Changes Among Top News/Talk Stories Yesterday (12/23). The decision by Sony to go ahead and release the movie “The Interview” on Christmas day after all; ongoing police killings protests in New York City and the slaying of two NYC cops over the weekend, plus President Obama’s comments on racism in America; chatter about the potential candidates for president in 2016; the death of rock icon Joe Cocker; the coming Christmas holiday; ISIS violence in Iraq; and the NFL playoff scenario and talk of potential coaching changes after the season were some of the most-talked-about stories on news/talk radio yesterday, according to ongoing research from TALKERS. Short Ideas for a Short Week. As the industry returns from a holiday weekend, digital media consultant Chris Miller offers some quick thoughts regarding your digital efforts. If you’re still wondering about the changes Facebook made that affect the way content lines up on your news feed, Miller has three items to consider. Also check out his thoughts on the type of content you put on your station website and whether that content lines up with your brand’s “message.” Plus, Chris has a final word about attitude. Check it all out here. Promotions Conflict at Philly Eatery Brings Abrupt End to Live Broadcast. The Philadelphia Daily News is reporting that the quick shutdown of a WIP, Philadelphia remote broadcast with afternoon hosts Anthony Gargano and Rob Ellis at Chickie’s & Pete’s may not have been the result of an ISDN breakdown but the fact that rival Greater Media sports talker WPEN personality Jon Marks was also at the establishment for a personal appearance. The paper reports that about 30 minutes into Gargano’s and Ellis’ broadcast, WPEN’s Marks arrived along with rock WMMR jock Matt Cord for a $1,000 MetroPCS giveaway in another part of the pub. The Daily News goes on to write that Chickie’s & Pete’s management tried to move Marks and Cord to a different part of the restaurant but Greater Media refused. CBS tells the paper the ISDN problem was the issue and while no one else is commenting, it appears it could have been nothing more than a scheduling snafu that ruffled the feathers of the stations involved. Linder Joins WMEN, West Palm Beach for Afternoons. The JCE Licenses-owned sports talk station names Jon Linder host of the 1:00 pm to 3:00 pm show, replacing Andy Slater who left for Clear Channel’s sports talk WINZ, Miami “The Sports Animal” in December. Linder joined WMEN as a fill-in host last year. He’s worked at Beasley’s WQAM, Miami serving as a sports reporter and studio host during Miami Hurricanes football broadcasts from 2010 through 2012. Cleveland Host Faces Jury Trial in Domestic Violence Charge. WKNR, Cleveland sports talk host Tony Rizzo will appear in Medina Municipal Court on February 27 for a jury trial after being accused of domestic assault by his wife Catherine Rizzo in December. Rizzo remains on the air at Good Karma-owned WKNR. The company issued a statement after the incident leading to the charge calling Rizzo “an exemplary teammate and member of the community and his status with us is unaffected.” Police were called to Rizzo’s home after his wife called them saying she had locked herself in the bathroom after Rizzo choked her and hit her in the face. Rizzo pleaded not guilty on December 9. Houston Talk Host Michael Berry Emcees Senate Campaign Fundraiser. KTRH, Houston-based talk show host Michael Berry is headlining a fundraiser for U.S. Senate candidate Col. Rob Maness (USAF, Ret.) on Friday, January 24, in Baton Rouge, Louisiana. Berry’s program is heard on stations across the U.S. including on WJBO, Baton Rouge from 5:00 pm to 7:00 pm. Maness is running for the Senate seat currently held by Democrat Mary Landrieu. Martin Luther King Jr. Day, Sochi Olympics Terror Threats, Syria Torture Allegations, ObamaCare Criticism, Wendy Davis Bio Questioned and Chris Christie Sandy Aid Charge Among Top News/Talk Stories Yesterday (1/20). The Martin Luther King, Jr. holiday; concerns over security at the Sochi Winter Games; new allegations of the Assad regime’s use of torture in Syria’s civil conflict; criticism of the rollout of the Affordable Care Act; Texas gubernatorial candidate Wendy Davis’ life story disputed by critics; and New Jersey Governor Chris Christie faces charges of misappropriating Hurricane Sandy aid were some of the most-talked-about stories on news/talk radio yesterday, according to ongoing research from TALKERS. Seven AEs Sue Clear Channel Claiming Civil Rights Violations. In a suit filed in the Eastern District of Louisiana by seven current and former AEs working at Clear Channel’s New Orleans stations, the group charges that after the economic downturn of 2008, accounts were redistributed at a meeting in Gonzales, Louisiana in February of 2009 in such a way that helped ease the financial hit Caucasian AEs were taking through the redistribution. The complaint alleges many of the redistributed accounts had been built up by African American AEs. The complaint – filed jointly by Wil Watson, Gary Watson, Prixie Montgomery, Ave Gaines, Darnetta Mahaffy-Nelson, Dinah Campbell, and Brandin Campbell – details salaries before and after the redistribution and concludes, “As a result of the redistribution of accounts, whether intentional or negligent, African-American account executives were disparately, and negatively, impacted, to their severe economic detriment as compared to their Caucasian counterparts…Overall, African-American account executives lost on average more than 40% of their 2008 income in 2008-9. On information and belief Caucasian account executives lost no more that about 15% of their 2008 income, on average, during the same period of time.” Three of the seven were fired, they allege, after complaining about the practices. The seven seek relief, punitive damages, general damages, attorneys’ fees and statutory remedies. “The State of News/Talk/Sports Programming” Panel Set for Talkers Los Angeles 2013. A diverse and powerful panel of front-line programmers has been set for Talkers Los Angeles 2013 that will explore the major issues of programming within the present-day news/talk/sports realm. Participating panelists include (in alphabetical order): Robin Bertolucci, PD, KFI/KTLK, Los Angeles; Skip Essick, PD, KMJ-AM/FM, Fresno; Andy Ludlum, director of news programming, KNX/KFWB, Los Angeles; Don Martin, senior VP sports programming, Fox Sports Radio/Clear Channel Media & Entertainment; Chuck Tyler, PD, KRLA/KKLA, Los Angeles; and Bill White, PD, KQTH-FM/KFFN-AM/FM, Tucson. The panel will be moderated by TALKERS VP/executive editor Kevin Casey who states, “This will be a fast-moving discussion that will really capture the flavor of today’s talk radio programming scene and do so with a solid Western states perspective – which makes this California edition of our two-part national conference so valuable. It will present a diverse array of formats including news/talk, all-news, and sports talk, as well as company types ranging in size and varied styles of corporate culture.” This third annual installment of TALKERS magazine’s West Coast convention is set for Thursday, October 10 and is already shaping up to be a blockbuster. The gathering is closing in on being an advance sellout some six weeks before the event so it is advisable for media professionals interested in attending to register now. It is again being presented in association with the Los Angeles Press Club and held at the historic Steve Allen Theater on Hollywood Boulevard in Hollywood between 9:00 am and 6:00 pm. Registrations – $149 per person – can only be taken over the phone. For sponsorship information or to register, call 413-565-5413. More agenda details coming in the immediate days ahead. Todd Feinburg Subs in Boston and Louisville. Boston-based talk show host Todd Feinburg is filling in for WBZ-AM, Boston’s Dan Rea on the evening program tonight and tomorrow (8-22/23). Next week he’ll be heard 829 miles away on Clear Channel’s WHAS, Louisville sitting in hosting the 9:00 am to 12:00 noon slot on both Thursday and Friday, August 29 and 30. The multi-faceted Feinburg spent many years working full time at Entercom’s WRKO, Boston. WIP-FM, Philadelphia Announces Howie Roseman Show. CBS Radio sports talk outlet “SportsRadio 94 WIP” is announcing Philadelphia Eagles general manager Howie Roseman will make weekly appearances on the afternoon drive show with Anthony Gargano – accompanied by Eagles play-by-play voice Merrill Reese – every Monday from 5:00 pm to 6:00 pm live at Chickie’s and Pete’s in South Philadelphia. The station states, “In addition to discussing each week’s game with Gargano and Reese, Roseman will take calls and talk with fans on site at Chickie’s and Pete’s. The show is the first of its kind. It is the only live weekly interactive radio show with an NFL general manager. The show, sponsored by Miller Lite, can be heard live on 94WIP, online at www.cbsphilly.com and via the Radio.com application for a variety of mobile devices. The show will debut on Tuesday, September 3 due to the Labor Day holiday and be heard on Tuesday, September 10 due to the Eagles-Redskins Monday Night Football debut on September 9. From 5:30 pm to 6:00 pm a leading Eagles player will join the show each week. Country Act The Lost Trailers Cuts Custom Theme Music for Dial Global’s “Sunday Night Football.” The theme music to Dial Global’s “Sunday Night Footbal” this season is a tweaked version of The Lost Trailers’ single “It’s Goin’ Down Tonight” that features football highlights, sound bites and customized lyrics. The company announces, “The new theme music, performed by The Lost Trailers and powered by Early Shares Music, will debut during the first regular season NFL broadcast on Thursday, September 5 which kicks off at 8:00 p.m. ET. The highly anticipated season opener between the Super Bowl Champion Baltimore Ravens and the Denver Broncos will feature Kevin Harlan and Boomer Esiason behind the microphones.” The band’s founding member Stokes Nielson states, “We are truly excited to be a part of the NFL broadcasts on Dial Global. We are huge sports fans and we can’t wait to help the announcers kick off every Sunday night game, because it’s goin’ down tonight, every Sunday night, all over America!” The band previously collaborated with Dial Global Sports, customizing their top 10 single “Holler Back” for the network’s opening montage in Super Bowl XLIII. Bradley Manning Verdict/Gender Issues, OK Thrill Kill Case, Averted Georgia School Shooting, NSA Surveillance Program, U.S.-Egypt Tensions, Syria Chemical Weapons Allegations and ObamaCare Implementation Among Top News/Talk Stories Yesterday (8/21). The 35-year sentence handed to Bradley Manning and his desire to begin gender change procedures; the case of three Oklahoma teens suspected of slaying Australian college baseball player Christopher Lane; a Georgia School staffer talks an armed man out of firing and averts a tragedy; the scope of the NSA surveillance program; the U.S. policy regarding Egypt; allegations Syria is using chemical weapons against citizens; and the implementation of the Affordable Care Act were some of the most-talked-about stories on news/talk radio yesterday, according to ongoing research from TALKERS. Fox Sports Radio Network to Offer Big Ten Football Show in Fall. Working in conjunction with the Big Ten Network, Fox Sports Radio announces it will offer a third season of “BTN Live” – a daily Big Ten football show. Beginning August 26, the program will be available for air Monday through Friday, 6:00 pm to 7:00 pm ET. FSRN says of the show, “Throughout football season, ‘BTN Live’ will take fans inside every Big Ten locker room as teams prepare for games, and provide the latest news, expert analysis, and interviews with players and coaches. The nightly show will be hosted by Big Ten Network personalities Dave Revsine, Mike Hall and Rick Pizzo, with Big Ten Network analysts Gerry DiNardo, Howard Griffith and other special guests. KBLU, Yuma Host Russ Clark Resigns; Moves to Crosstown KCYK. Yuma, Arizona TV station KSWT-TV reports talk show host Russ Clark resigned from his program on El Dorado Broadcasters’ KBLU on the air, surprising listeners and his employer. Clark tells the TV station he’s taking his show across town to MonsterMedia’s country KCYK “Outlaw Country 1400” beginning April 2. “They had no idea. They took away my morning show and gave me a one-day-a-week, which, I think was an effort to keep me somewhat engaged without having me be directly opposed to them or directly in competition. But, of course, I need to get back on air. I need to get back to what I was doing.” Clark says KBLU management wanted more news and less talk in the AM drive. Patrick in for Cunningham Sunday Night. Houston talk show host Matt Patrick will fill in again this Sunday, March 24, for Bill Cunningham on the Premiere Networks nationally syndicated “Live on Sunday Night, It’s Bill Cunningham” program. Patrick, whose “day job” is hosting the morning drive program on Clear Channel’s KTRH, Houston and the afternoon program on sister KPRC, is a regular fill-in host for Cunningham as well as Portland talk host Lars Larson. Sequester Effects Top Talk Radio Topic for Week of March 18-22. This is the fifth straight week that the sequester effects and related budget battle have been at the #1 spot on the Talkers TenTM as the most-talked-about story on news/talk radio. This week, at #2 is President Obama’s trip to Israel. Coming in at #3 is North Korea’s threats followed by Iran’s nuclear ambitions at #4. The Talkers TenTM is a weekly chart of the top stories and people discussed on news/talk radio during the week and is the result of ongoing research from TALKERS. View this week’s entire chart here.